5 stars. 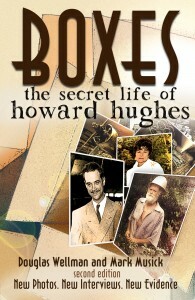 “Having read many books about Howard Hughes throughout the years, I was delighted to see a new one. At first I was pretty skeptical at the premise, a woman claiming to have been married to a mystery man for 31 years, who turned out to be Hughes, yet she’s basically unknown. But I was won over once I settled into the story, and read along as the woman, Eva McLelland explained it to co-writer Mark Musick, a retired major general. It came up as they were making the long drive back to Eva’s home in Alabama from the Gulf Coast, where he’d helped her to scatter her husband’s ashes. Musick was doubtful at first that her revelation about her husband’s identity could be correct. But as she spent hours telling story after story about their long lives together, he realized she couldn’t be making up so many memories, and in such detail. He became hooked, and began 8 years of research into it to verify or rule out the things she’d said. It actually makes more sense than the weird story that Hughes was really the emaciated, long-haired, drug-addicted man who resided for years on a floor of the Desert Inn Hotel in Nevada, and died in such a horribly emaciated condition on April 5, 1976. That man was apparently a double, which allowed Hughes to be free to live his life elsewhere with Eva, who knew him as Verner ‘Nik’ Nicely. He later died at the advanced age of 96 in 2001. Musick ended up believing her story, which his research and documentation over the years never had shaken. In the confusing and often contradictory information and records on Hughes, many times Eva’s story cleared things up. And not that their lives together weren’t also strange. They mostly moved from place to place, renting different homes and apartments, yet shadowed by Hughes’ associates who kept him in touch with those running his businesses. “This is the very unusual, highly debated story of what happened to Howard Hughes​ after he ‘died’. An elderly lady, Eva Renee McLelland, claims that she had been married to a man who was the real Howard Hughes for over 30 years, and the authors share her story, their research, and tries to prove that Eva’s story is the correct one.